Recently I toured the SEM Factory to gain knowledge of the SEM Jackhammer Series Hard Drive Shredders; I was impressed to find out all the custom options available with the ability to add several system enhancements. Security Engineered Machinery truly lives up to its’ name, many of the Jackhammer Series Hard Drive Shredders are custom engineered to meet specific security requirements, volume requirements and safety constituents. When I toured the SEM Factory I went “under the hood” on all four magnetic hard drive destroyers: SEM Model 0300, SEM Model 0301, SEM Model 0302 and SEM Model 0304. Steel Fork Pockets – Enables users to move the hard drive shredder via fork lift. Since the machine weighs 1200 pounds some users may not desire to push the machine via casters and enables transport or truck loading. Caster Mounting Brackets – A useful feature for clients wishing to create a fixed operation or for mounting in a truck for mobile destruction services. 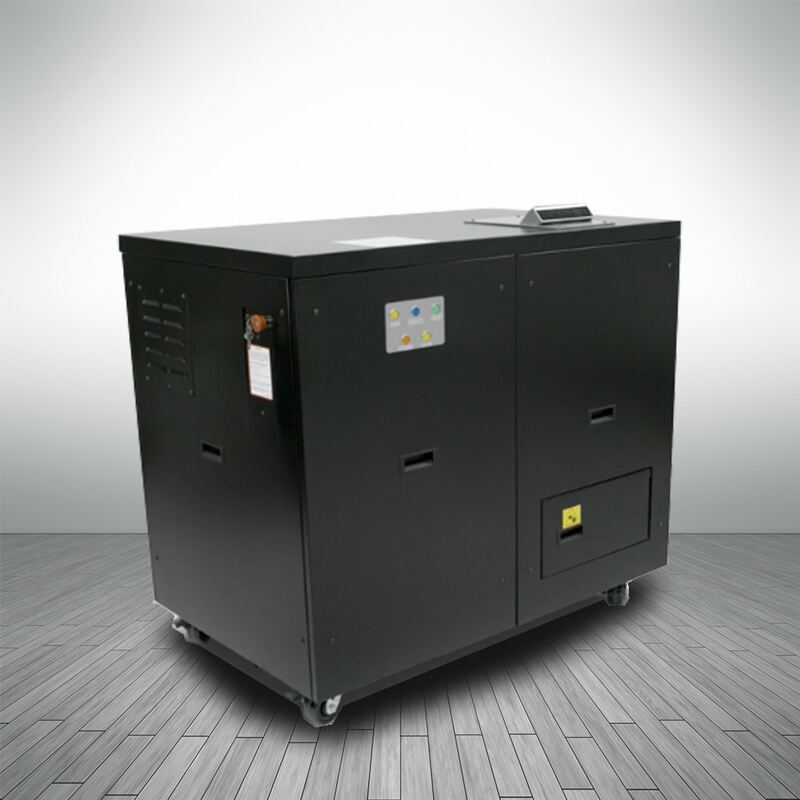 Buck Boost Transformer – Equalizes power supply to boost voltage to optimize system performance. Replacement HEPA Filter – The SEM Model 0300 Jackhammer has an integrated HEPA Filter; it is advisable to purchase a spare filter to ensure a healthy operating environment. Extended Warranties – SEM offers the ability to extend the base two year standard warranty with options of one, two and three year extended warranty packages. Preventative Maintenance – SEM enables clients to have peace of mind and have factory certified technicians perform routine scheduled maintenance as recommended by user manual. These are scheduled at intervals based on volume and usage hours. Custom Paint/Designs – User selected colors, affiliates or corporate logos are available! Optional-Integrated HEPA Filter – Used to reduce odors and reduce particulates. Replacement HEPA Filter – The SEM Model 0300 Jackhammer has an integrated HEPA Filter, it is advisable to purchase a spare filter to ensure a healthy operating environment. Removable “In Feed” Chute – Enables movement of equipment through tighter spaces/doorways, reduces width of machine. Wider “In Feed” Chute Openings – Allows more production and destruction capabilities for items beyond hard drives!